With the Northwest Monsoon season coming to an end between late September and early October, weather patterns in northern ASEAN will shift from wet with heavy rainfall towards a drier and cooler climate. Occasional storms and thunderstorms may still cause flash floods within certain parts of northern ASEAN. During September, the Philippines experienced Super Typhoon Mangkhut, which passed through the nation’s Northern regions and islands around the vicinity. The typhoon brought about heavy rainfall and triggered deadly landslides, causing significant destruction and devastation to agricultural crops. However, as a result of the changing trade winds, the cyclone season is returning, with increased vigilance required as the likelihood of cyclone formation increases in the Bay of Bengal. A large number of earthquakes have been recorded throughout the past 2 months. The increased seismic activity has not only been occurring within the region, but also on a global scale. During Week 34 of 2018 (from the 20th to the 26th of August), a total of 232 earthquakes were recorded across the Pacific “Ring of Fire” and its adjacent tectonic plates. Of these recorded earthquakes, 37 (15.9%) were recorded to be M 5.0 and above. Of these major earthquakes (≥M 5.0), 25 (67.6%) occurred within a 48-hour period between the 20th and 22nd of August. 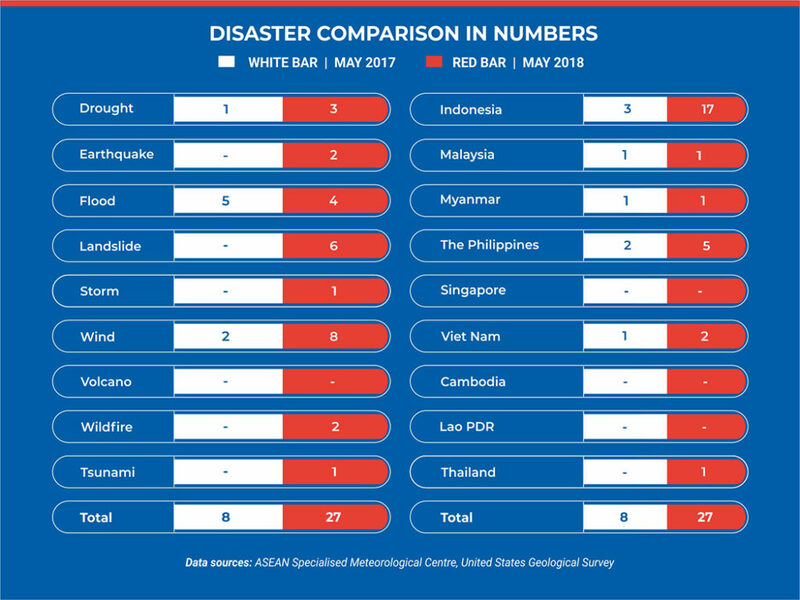 Of the 232 earthquakes across the world, 32 (13.8%) were reported within ASEAN region, of which 11 (34.4%) were reported to be M 5.0 and above. The overall increase in seismic activity is currently being monitored by seismological agencies, in the anticipation of increased volcanic activity, earthquakes, tsunamis and other resultant hazards. Nevertheless, during the last few months, the activity of volcanoes in the Philippines and Indonesia have remained within their normal threshold, and have experienced no changes to any of their alert levels. The Southwest Monsoon season is expected to transition to the inter-monsoon period around mid-October, and persist for some weeks before giving way to the Northeast Monsoon season in late-November/December. During the coming weeks, the prevailing south-easterly or south-westerly winds are expected to gradually weaken to become light and variable in direction. A gradual strengthening of north-easterly winds can be expected in the later part of the Oct-Nov-Dec (OND) season. Characteristically, this is accompanied by a southward shift of the monsoon rain-band, which will bring more rainfall over the southern ASEAN region. The northern ASEAN region will experience lighter rainfall as the season progresses, while in equatorial areas, below-average rainfall is forecast to continue for October. Temperature-wise, above-average conditions are expected over many parts of ASEAN, with warmer-than-average conditions expected over the equatorial ASEAN – particularly in Borneo and south-eastern Sumatra. In northern ASEAN, occasional hotspots may emerge as drier conditions set in toward the later part of the OND season, however, should remain subdued in the early parts due to wet weather. In southern ASEAN, brief periods of dry weather may contribute to increased hotspot activities in October. This could lead to an occurrence of transboundary haze affecting some parts of the region. However, an increase in shower activities with the onset of the inter-monsoon period will help subdue hotspot activities. Isolated hotspots may develop occasionally, but these hotspots are expected to be short-lived and localised. In equatorial ASEAN, drier-than-usual weather could to lead to an escalation in hotspot activities and an increased risk of trans-boundary smoke haze. The outlook is assessed for the region in general. For specific updates on the national scale, the relevant ASEAN National Meteorological and Hydrological Services as well as Geological Services of ASEAN countries should be consulted. 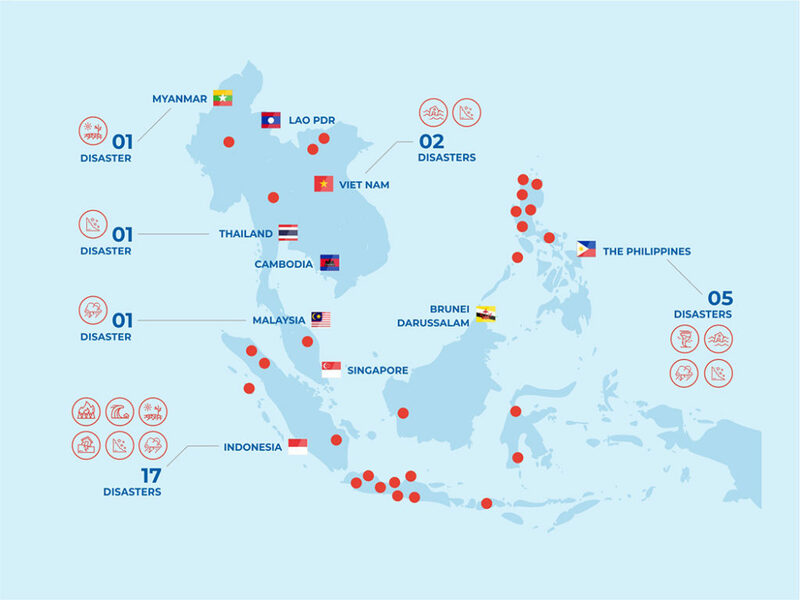 AHA Centre’s estimation is based on data and information shared by National Disaster Management Organisations (NDMOs) and other relevant agencies from ASEAN Member States, international organisations and news agencies. 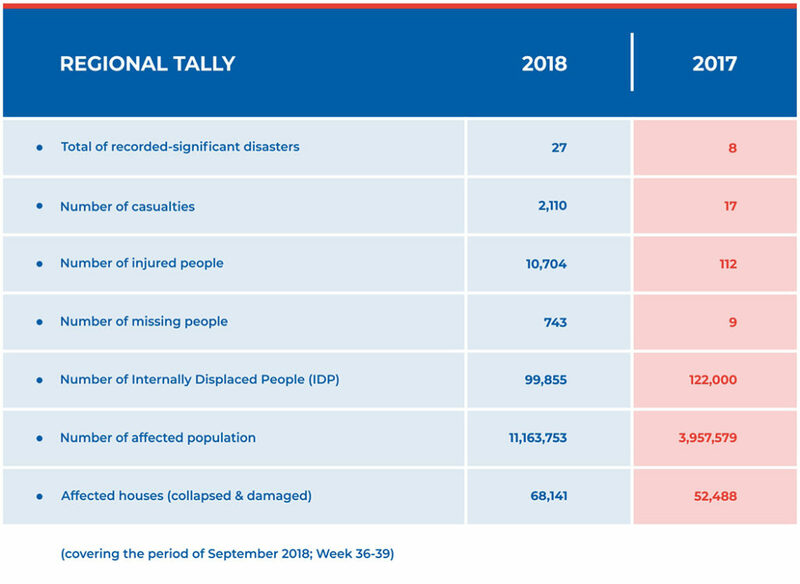 Further information on each recorded-significant disaster, description and detail of data and information are available at: http://adinet.ahacentre.org/reports.